"Games and Politics" will be exhibited at the Goethe-Institut Nigeria between April 23 and May 15, 2019. It will be accompanied by a supporting programme, which will include a VR Workshop for journalists. The German curator Leon Hösl first encountered Nigeria outside its shores, before visiting for the first time this November. Goethe-Institut Nigeria is organizing a logo and slogan design contest for German learners in Nigeria. At the Decolonizing the Campus symposium in Lagos, numerous local and international architects will take a critical look at design theory and university buildings from the early and transitional years of Nigerian independence as part of bauhaus imaginista. The focus of the discussion is Obafemi Awolowo University in Nigeria, which was founded in 1961 in protest against British education policies at the end of colonial rule. 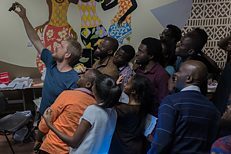 The Goethe-Institut invites aspiring African writers of all ages interested in writing for Young Adults (YA) to submit short stories of 3000-5000 words in length in Kiswahili, English or French.